Like the art at neighboring 21c Museum Hotel, the farm-fresh menu at Proof on Main is ever-rotating. 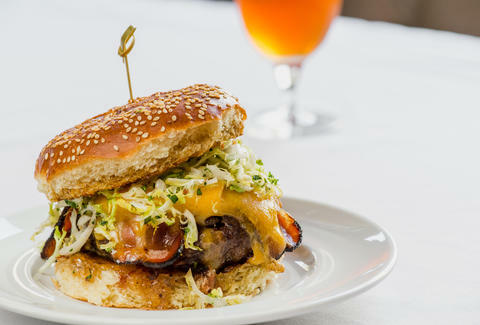 The demand for the much-lauded Bison Burger is met year-round, however, it's an iconic dish that has been on the menu since this signature Louisville restaurant opened its doors in 2006. What's not to love about an ample bison patty cloaked in Tillamook cheddar cheese, layered with smoked bacon and served with a side of sweet Jezebel sauce? The mile-high pile of French fries served alongside is simply the cherry on top. 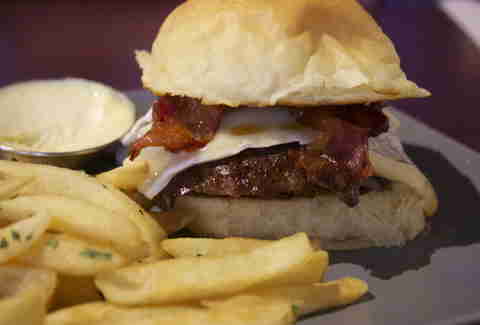 Any gastropub worth it's salt has a killer burger on the menu and The Village Idiot in Lexington does not disappoint. Its signature burger, dubbed The Idiot, is an embarrassment of burger riches, a half-pound of Angus beef topped with cheddar and a massive onion ring filled with pulled pork. When you've got all of this sandwiched between a warm pretzel bun, you'd be an idiot not to order The Idiot. You know you're in a classic, bordering-hole-in-the-wall joint when your burger is served to you wrapped in plain white paper, with warm cheese oozing through that wrapper. 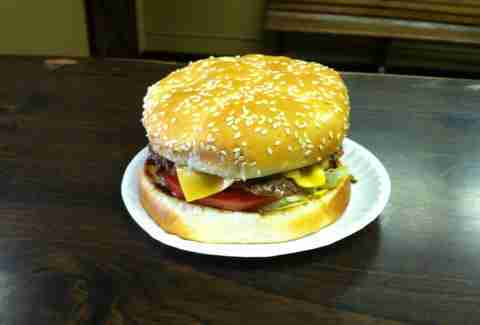 This is how they serve the hand-formed patties at Pat's Snack Bar, and Manchester residents, both current and former, continue to fill the room for a taste of Appalachia's best burger. The burgers are made to order at Pat's; the cheese and bun added to the beef while still on the grill, ensuring maximum greasy goodness. 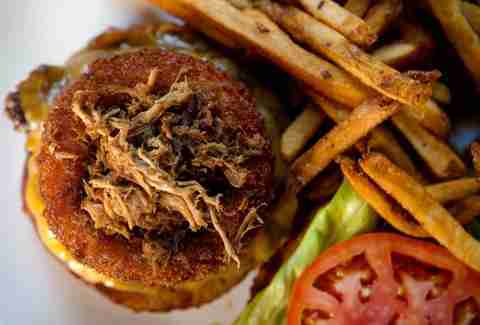 When it comes to “best burger” lists, Grind is ever present both nationally and stateside. It is no surprise that this food-truck-turned-brick-and-mortar-burger-making machine has landed at the top of every burger lover’s list. Its signature house blend of local grass-fed beef is a no-brainer and, when seared thin until the edges are caramelized, a direct gateway to burger nirvana. The B&B was its original creation, a marriage of Brie cheese and bacon made that much more tasty with the addition of habanero jam. The drive-in burger/shake-shack game is on point in Owensboro, with Gary's Drive-In and Big Dipper in a photo finish for Western Kentucky's best burger. Gary's is a straight-forward burger joint with a hamburger-heavy menu accompanied by homemade chili, onion rings, and fried bologna sandwiches. We recommend ordering one of its house-made malts to round out your meal. 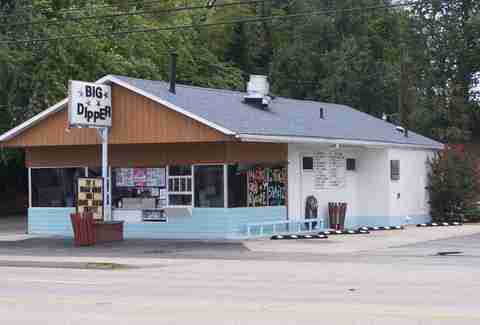 BD has been holding court in Owensboro since 1954, and it's hard to imagine that there is a better burger of the drive-in, greasy-spoon variety in The Bluegrass State, than the patties being slung at Big Dipper. The Through the Garden Burger smothers is its classic hamburger smothered with every topping up for grabs. Extra napkins are happily required. It should be mandated that every university have an Irish pub within walking distance of campus. Lynagh's has been filling the Irish pub void in Lexington for UK students and locals alike since 1981, with a long and varied menu highlighted by its classic O'Round burger. It's prepared traditionally, and ground sirloin is seared on a griddle until crisp at the edges and then topped with cheese, lettuce, tomato, and red onion. Want to step outside of the box? The Beer Cheese Burger and the Lynagh's Burger with avo will also quell even the strongest of burger cravings. They don't skimp on their burgers at Zola's Pub and Grill, using a full half pound of Angus beef to craft each one of their original hamburger creations. The Zola Patty Melt and The Cajun Bell are delicious standouts, but it's the Black and Bleu burger -- think creamy bleu cheese dressing smothered over a well-seasoned and blackened hunk of beef -- that keeps locals coming back, time and time again. 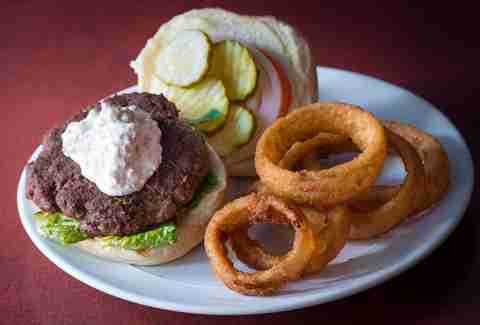 The Mary Burger, named for Chef and Owner Mark Wombles’ grandmother, has become a mainstay at this upscale dining gem, set in the center of historic Midway, Kentucky. The recipe for Heirloom’s signature burger was passed down from its namesake and is packed with flavor, so much so that the menu touts that Johnny Unitas, a family friend, would travel all the way from Baltimore to Mary’s home just to indulge in her burger. While hot dogs and chili put Weaver’s on the map, it’s its burgers that keep residents coming back for more. Our favorite is the Kentucky Blue Burger, topped with both blue cheese crumbles and a creamy blue cheese spread, and topped with lettuce, tomato, and red onion to keep things fresh.